News writing is the basic news reporting you’ll find in print. News writing explains the who, what, when, where and why of noteworthy items. The length will vary, as will the subject matter. 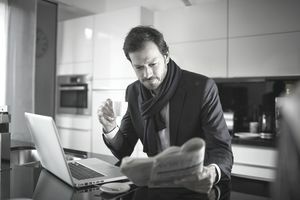 Generally, the news is covered by a staff writer as it occurs, but freelancers may be able to slant recent news into a feature article or research the news event more in-depth. There's also the possibility of a scoop – the stars align and you know something has occurred that no one else is aware of yet. But it's only a matter of time, so a freelancer would have to work at lightning speed to produce a quality article accepted for publication. Pitching the idea alone won't work – now you've just given away your scoop. Another element of this is feature writing. Feature articles are often longer and they may cover lifestyle or cultural topics. They're often considered “softer” than current news articles. Think of sponsored content as something like advertising. It looks like editorial content and it reads like editorial content but, in fact, it's paid for by an advertiser and it's intended to promote the advertiser's service or product. An auto manufacturer or dealership might buy a page dedicated to a piece about road travel. And, of course, the copy would mention that the manufacturer's or dealer's new model would be ideal for a road trip and why. Also called "native advertising," sponsored content is typically covered by staff writers, not freelancers. A freelancer would have no way of knowing what advertisers are on board with this new advertising technique. You might write about that road trip, but if the newspaper has no automotive advertisers who are interested in sponsored content, you won't sell your content. Of course, you can always pitch the idea and supply the advertiser, perhaps for extra payment in the form of a commission. Columns may be guessed, freelanced or syndicated from other news organizations. They generally – although not always – follow an established theme and these may also be "softer” than hard news, but, again, not always. Op-eds are opinion pieces. They're generally not written by freelance journalists unless the journalist is working for another organization in a PR capacity. Op-eds live “opposite of the editorial” page – thus, they're called "OP"posite-"ED"itorial. Op-eds are around 600 words and usually take a position on an issue by someone of note in the field. Again, these aren’t generally written by the freelance journalist, but they're an important aspect of most papers. These opinion pieces are shorter and often come from the reading audience of the publication. Writing for newspapers requires an ability to quickly discern the interests of the public, find timely and often local resources, and produce copy that is simple and scannable. Writing newspaper articles such as these is a skill that many writers can cultivate.